Do you have the habit of making backup of your devices in iTunes? Do you have some iTunes Backup files stored on your PC or Mac? Are you tortured by the problem of failing to review iTunes file and looking for a way to extract and preview these files of iTunes Backup? Here, iFonebox, the professional iTunes Backup Extractor, is able to allow you retrieve and access all the data in iTunes Backup. 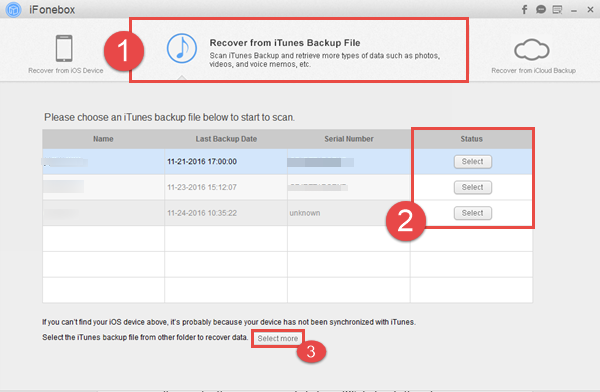 To know the steps of how to extract data from iTunes Backup, just follow below tutorials of Windows version. The steps of Mac are similar. Install iFonebox on your computer and then start it. You will see the interface as follows. Then just choose “Recover From iTunes Backup”. Then all the iTunes backup that you once backed to your computer will be displayed in the interface, choose the one you need and click “Start Scan” to begin the scanning of your iTunes Backup. If you changed the location of iTunes backup folder when you made these backup, you are allowed to choose these backup folder by yourself. Tip: If your iTunes backup is encrypted, it will ask you to enter the password when you choose to scan it. The password for creating the backup with iTunes is essential, otherwise, iFonebox will not work with encrypted backups. When the scanning is finished, all the data in iTunes Backup including photos, videos, contacts, messages, message attachments, call history, calendar, reminder, notes, voice memos and safari bookmark is showed one by one in category. 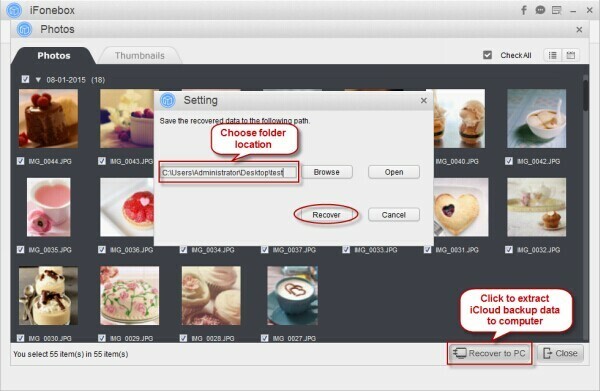 Then you could click the “Recover” button on interface to restore these data to your computer for previewing and other using.